The $3 Princess gold coin was authorized by the Act of February 21, 1853 and was produced from 1854 through 1889. 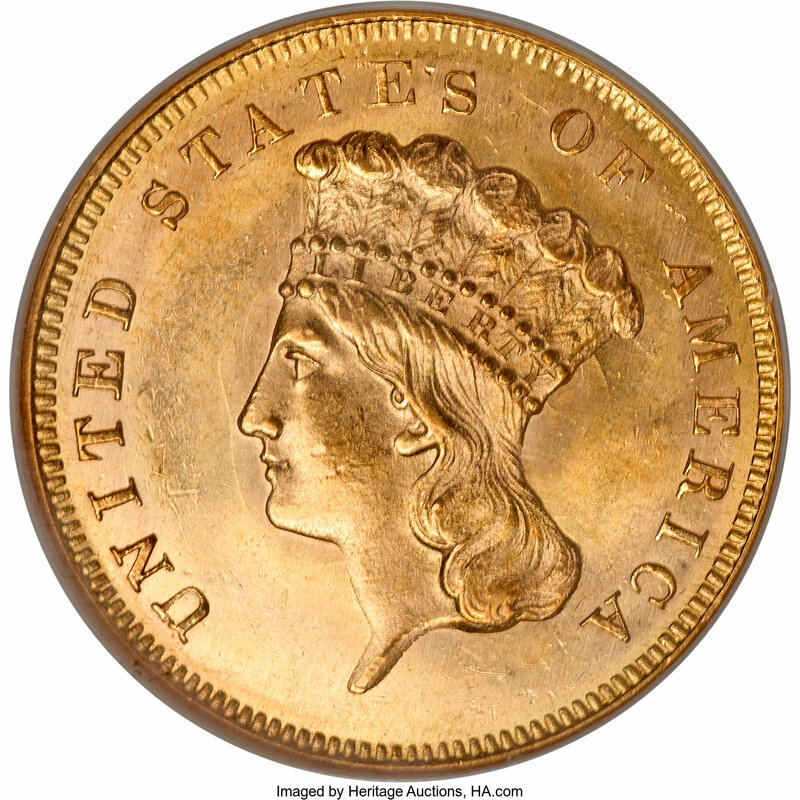 The $3 gold coin was perhaps most useful for buying 100 postage stamps, each of which was sold for 3 cents in the 1850s and frequently purchased by the use of 3 cent silver trimes. $3 gold coins saw their widest use in the East and Midwest throughout the 1850s and into the early 1860s and were popular in the West for the duration of the series' run. The $3 Princess was designed by James B. Longacre and remained relatively unchanged over the course of the series. The obverse of the $3 coin depicts a Native American princess, while the reverse features a wreath of tobacco, cotton, wheat, and corn encircling the denomination, $3, and the coin?s date. In 1854, the word "DOLLAR" appears significantly smaller than it does on issues from later in the series. The only year that saw production of more than 100,000 pieces was during the first year of issue in 1854, when the Philadelphia Mint struck 138,618 pieces. Mintages tapered off markedly afterward, and by the 1860s had regularly dropped below 10,000 pieces. The only exception was 1874 and 1878, when 41,800 and 82,304 pieces, respectively. Many issues are considerably scarce, with the Dahlonega, New Orleans, and San Francisco among the toughest. The rarest issue is from 1875, which has a mintage of only 20 pieces (all proof) and often trades for six figures.